...and ends culminates with a Polynesian sword of fire! Experience interactive activities before the show including lei making! Begin your evening with a classic Mai Tai! At Ka Moana Luau, witness world class entertainment and feast on delicious luau cuisine! Join their ʻOhana (family) for an exciting evening under the stars as they take you on a voyage across Ka Moana (the Ocean). The amazing show begins and ends with fire! You will experience beloved traditions of the islands during the interactive activities before the show including lei making, hula lessons, coconut-headband weaving, poi & lomi lomi samplings, ukulele lessons and more! Ka Moana Luau is located at the iconic Sea Life Park Hawaiʻi, and every lūʻau ticket comes with free admission to the park (up to seven days to redeem). You will be inspired by the incredible marine animals during a show or by observing them in their habitats. If you want a more unique experience, you can even swim with Dolphins, Sharks, Sea Lions, or Hawaiian Rays! Dinner selections are from executive chef Joshua Bullock, formerly of Michael Mina’s The Street. 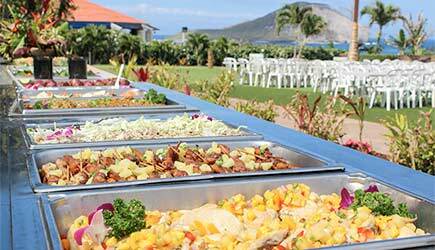 The buffet selections include seasonal fruit salad, fresh island greens salad, local sweet potatoes, island-style taro rolls, teriyaki chicken skewers, fresh mahi mahi with papaya mango salsa, and juicy kalua pork. For dessert indulge in coconut and guava chantilly cakes or fresh baked macadamia nut cookies. The bar offers Island Mai Tai’s, wine, domestic beers, and soft drinks. After you dine, enjoy an award- winning production highlighting the vibrant traditions of Hawaii and Polynesia! The experience culminates with a Polynesian sword of fire! This package includes a shell lei, one standard drink ticket, standard luau seating, buffet dinner, and admissions to Sea Life Park Hawaii. All the features of the Classic Package plus the following – an additional drink ticket and deluxe luau seating. This premium package includes a fresh flower lei greeting, welcome Mai Tai plus two premium drink tickets per person, VIP seating, buffet dinner, souvenir photograph (one per group), and admission to Sea Life Park Hawaii. All luau packages include complimentary admission to the shows and exhibits at Sea Life Park. You may redeem this admission up to 7 days after the night of the luau, or you may visit Sea Life Park in the afternoon of the day of your luau. For those ordering transportation, Waikiki pickup times for luau transportation are around 4pm (plus or minus 15 minutes). If you need transportation to the luau but want to visit Sea Life Park first, a MIDDAY pickup is offered on our reservations form for Ka Moana Luau. Schedule: Sunday, Monday, Tuesday, Wednesday, and Friday evenings. If you are extending your stay with extra days in Honolulu before or after your cruise, you can attend Ka Moana Luau. If your ship stays overnight in Honolulu, transportation is available from the Aloha Tower at 11:30am (early pick up to enjoy Sea Life Park) or 3:30pm. Sea Life Park’s idyllic Makapu’u Beach location offers a spectacular setting for a luau. The blue Pacific Ocean, the shape of Rabbit Island a mile offshore, the cliffs of Makapu’u and it famous lighthouse standing as a sentinel … as you sit here soaking it all in you’ll feel a million miles away from the hustle and bustle of the “concrete jungle” that is Waikiki and Honolulu. Admission to Sea Life Park with its shows and exhibits is complimentary. We recommend allowing three hours for seeing the park, so if you’d like to enjoy the park in the afternoon before the luau we do recommend you arrive between 1pm and 2pm. This complimentary admission doesn’t include any of the dolphin swimming programs. Those interactions are a bit pricey and need to be arranged on their own on our Sea Life Park page. The other luau that we would say ranks as high as this one for a fantastic and spacious oceanfront property Paradise Cove Luau which is the other direction … on the west side of the island near Ko Olina.